WITSTREAM® IS A NEW KIND OF COMEDY BRAND, delivering a steady stream of up-to-the-minute comedy headline news to audiences in real time across media platforms. WitStream is the only curated, live comedy news ticker providing an endless flow of hilarious commentary 24/7. WitStream’s content is available via its website, mobile devices, syndication, digital out-of-home networks, and sometimes even live. It is the nexus of an exclusive group of established comedians, professional comedy writers and all-around brilliant humorists, from famous comedians to the people who bring you Saturday Night Live, Late Night with Jimmy Fallon, The Daily Show with Jon Stewart, and more. You used to wait hours and sometimes days before getting the comedic take on the news, but now you can have it while the stories unfold. WitStream.com helps audiences break through the clutter of online comedy to find what’s really funny about what’s happening, NOW. WitStream was built on the notion that consumers need an easy, one-stop solution to streamline the digital comedy experience. It is easy to become overwhelmed by the massive amount of content online: for every laugh-out-loud one-liner, there are dozens of boring tweets, status updates and videos that end up, well just being a waste of time. Facebook “friends” have an opinion about everything, but that doesn’t mean you want to be subjected to it. WitStream culls through the dull to bring users comedy headline news—and only the best-written, funniest headlines with a distinct point of view. WitStream contributors strive to take their commentary past the obvious, so you’ll be the first to know about breaking news—and get the wittiest takes on it, all in a quick, funny snack. WitStream is also the premiere go-to destination for live television and news events, from coverage of the Academy Awards to the Olympics to late-breaking political news. It’s a joke-centric second screen experience that enhances tedious hours of awards shows, sporting events, talking heads, and commercial breaks with a healthy dose of snark. WitStream partners with outlets like TVGuide.com, the Huffington Post, Jest.com, and 7-11 TV to spread our musings to a broad and eclectic vertical audience. WitStream has been nominated for Best Comedy App by Comedy Central and has appeared in numerous articles about comedy and the changing media landscape. WITSTREAM WAS FOUNDED BY LISA COHEN, a seasoned media executive, who has worked in several facets of the media, advertising, and digital entertainment businesses at companies such as Nickelodeon, HarperCollins, and Simon & Schuster. Having worked on some of the world’s largest brands, Lisa started her career as a graphic designer and art director, where she honed her expertise in visual identity, communications and consumer marketing. Over the past decade, Lisa has garnered extensive experience in the entertainment and comedy worlds. She has worked as network television producer, producing comedic reality shows, and as a talent scout and producer of live comedy shows and festivals across the country. Lisa is a frequent speaker at comedy and digital media events such as South by Southwest, and has been regularly quoted in publications such as the New York Times and the Huffington Post. Most recently she was a judge for the Washington Post Humor Contest. Lisa created WitStream as she saw an opportunity in the converging worlds of digital media and comedy. WitStream was created to cut through the endless sea of social media status updates and posts—to get audiences straight to the comedy. WitSream is a discovery engine to help showcase top tier comedy talent: get to know the people Lisa loves, and fall in love with them, too. Lisa earned her BA from Columbia University and lives in New York City with her husband, David Hillman, and their two children. Seed round investors include Howard Lindzon (StockTwits), Social Leverage (Bit.ly, TweetDeck, Buddy Media), Shervin Pishevar (Menlo Ventures), and Leon Wagner (Golden Tree Asset Management). SO HOW IS THIS DIFFERENT FROM TWITTER? CAN’T I JUST FOLLOW COMEDIANS ON TWITTER? IS THERE ANY OTHER WAY TO GET WITSTREAM JOKES? I REALLY LOVE A JOKE I SAW ON YOUR SITE. WHAT SHOULD I DO ABOUT IT? WHAT DOES “FUNNY, BUT WRONG” MEAN? WitStream is curated, up-to-the-minute comedy commentary: we take the funniest and sharpest political and entertainment news headlines from across the web and deliver it all to you on our app and via WitStream.com. With WitStream, you don’t have to wait for the news or late night comedy shows to get the funniest take on the day’s events: the jokes happen in real-time, not network time. WitStream’s Aristocrats are a mix of comedy professionals and ordinary people who are just plain funny. For more information, click here. WitStream’s unique design is user-friendly, easy to navigate, and sorted by topics. We do the finding and following so you don’t have to. At WitStream, we cut out the filler and focus solely on the best-written comedy. Everything on WitStream has been read through our filter, which ensures a unique—and hilarious—sensibility. Sure. But maybe you don’t want to let that be your entire experience. You use Twitter to follow friends, your career, and your favorite brands. On WitStream, it’s just funny people saying funny things. So glad you asked! You can subscribe to our Daily WitPicks to get three topical jokes in your email inbox every morning. For special television events, such as the Super Bowl, the Oscars, season premieres, political news, and more, WitStream also partners with sites like the Huffington Post and TVGuide.com, helping create a second screen experience. So you can watch TV while laughing along with the best live comedy commentary available. You’ve got several options. You can tweet the joke, put it on Facebook, or email it to a friend. And if you’re on Twitter, you should follow those writers you love, and give them props with a retweet or a star. If the joke makes you cringe, you can click the “Funny, but Wrong” button. If you laughed, but immediately felt guilty, it’s probably because the joke was “funny, but wrong.” WitStream is the first to admit that comedy is often offensive, but that doesn’t always mean it’s not clever or insightful. “Funny, but Wrong” gives you permission to chuckle and shake your head at the same time. WitStream® is your 24-hour live comedy ticker. An endless flow of up-to-the-minute comedy and commentary delivered to you in real time: what’s funny, about what’s happening, NOW. Assembled at WitStream® is an exclusive group of established comedians, professional writers and all-around brilliant humorists. Read topical gems from the people who bring you Saturday Night Live, Late Night with Jimmy Fallon, The Daily Show with Jon Stewart, The Onion and more. Check in if you want to hear their take on the latest in celebrity shenanigans, political idiocy, or even their own daily lives, however mundane or extraordinary. Whatever’s happening now, this crew can see right through it and find something hilarious to say. So stop expecting to find real entertainment on Facebook or Twitter--you waste enough time there already. And let’s face it: no one wants to hear what you have to say anyway. Just read WitStream®. We’ll make sure it’s only the good stuff. Founder and Chief Executive Officer Lisa Cohen is a freelance television producer with extensive experience in the comedy industry. Her credits include "Funniest Mom in America" 2 and 3, "She’s Got the Look" 1 and 2, and "High School Musical: Get in the Picture." Prior to her work in the comedy industry, Ms. Cohen spent 10 years as a graphic designer in the media business. Most importantly, Lisa is sick and tired of reading updates like "Lisa is sick," or "Lisa is tired." All too often, in a time of acute boredom, she looks to her smartphone for entertaining updates only to find the mundane and uninspired. She cursed the system for not giving her an endless stream of comedians’ updates, until she finally realized she had to build it herself. You will not interfere with or attempt to interrupt the proper operation of the Website through the use of any virus, device, software or routine, or access or attempt to gain access to any data, files, or passwords related to the Website through hacking, password mining, or any other means. Please be aware that the majority of the content found on or through Website is for general audiences, but there may be certain adult or mature content. Accordingly, individuals who are less than 13 years of age should not use the Website. We reserve the right, in our sole discretion, to deny you access to the Website, or any portion of the Website, without notice. 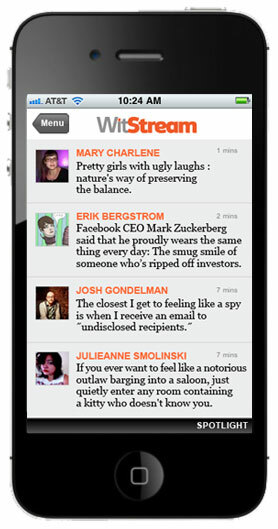 WitStream is a social network and micro-blogging platform that gives member comedians (a.k.a. "Aristocrats") an exclusive playground, and Visitors and Subscribers a place to read the most entertaining updates on their computers and smartphones for free. WitStream provides Aristocrats, Subscribers, and Visitors with access to the Website as described in this Agreement. Visitors. No login is required for Visitors. Visitors to the Website can (a) view all publicly-accessible content, including all micro-blogs, articles, and discussion groups; and (b) contact WitStream. Subscribers. Login is required for all Subscriber services. Subscribers can (a) view all publicly-accessible content, including all micro-blogs, articles, and discussion groups; (b) create and edit their personal profile; (c) sort and manage micro-blogs and discussion groups; (c) sign up for alerts and other notifications; (d) send comments (the "Subscriber Content") to Aristocrats, who may post those comments publicly; and (e) contact WitStream. Aristocrats. Login is required for all Aristocrats. In addition to all the cool things that Subscribers can do, Aristocrats can also (a) submit, post, upload, and display comments, text, information, graphics, images, photos, profiles, audio and video clips, links, and other materials (collectively "Aristocrat Content") to the Website; and (b) communicate among other Aristocrats. Although we encourage Aristocrats to submit Aristocrat Content, we do not want Aristocrats to, and Aristocrats should not, send us or post any Aristocrat Content that contains confidential information. WitStream is under no obligation to accept any individual as a Subscriber or Aristocrat, and may accept or reject any registration in its sole and complete discretion. During the registration process for Aristocrats and Subscribers, we will ask you to create an account, which includes a unique sign-in name ("Sign-In Name"), password ("Password"), and perhaps certain additional information that will assist in authenticating your identity when you log-in in the future ("Unique Identifiers"). When creating your account, you must provide true, accurate, current, and complete information. Each Sign-In Name and corresponding Password can be used by only one Aristocrat or Subscriber. You are solely responsible for the confidentiality and use of your Sign-In Name, Password and Unique Identifiers, as well as for any use, misuse or communications entered through the Website using one or more of them. You will promptly inform WitStream of any need to deactivate a Password or Sign-In Name, or change any Unique Identifier. WitStream reserves the right to delete or change your Password, Sign-In Name, or Unique Identifier at any time and for any reason. WitStream will not be liable for any loss or damage caused by any unauthorized use of your account. The Website contains material, such as software, text, graphics, images, sound recordings, audiovisual works, and other material provided by or on behalf of WitStream (collectively referred to as the "WitStream Content"). The WitStream Content may be owned by us or by third parties. The WitStream Content is protected under both United States and foreign laws. Unauthorized use of the WitStream Content may violate copyright, trademark, and other laws. You have no rights in or to the WitStream Content, and you will not use the WitStream Content except as permitted under this Agreement. No other use is permitted without prior written consent from us. You must retain all copyright and other proprietary notices contained in the original WitStream Content on any copy you make of the WitStream Content. You may not sell, transfer, assign, license, sublicense, or modify the WitStream Content or reproduce, display, publicly perform, make a derivative version of, distribute, or otherwise use the WitStream Content in any way for any public or commercial purpose. The use or posting of the WitStream Content on any other website or in a networked computer environment for any purpose is expressly prohibited. If you violate any part of this Agreement, your permission to access and/or use the WitStream Content and Website automatically terminates and you must immediately destroy any copies you have made of the WitStream Content. The trademarks, service marks, and logos of WitStream (the "WitStream Trademarks") used and displayed on the Website, including Witstream.com and WitStream®, are registered and unregistered trademarks or service marks of WitStream, LLC. All rights are reserved by WitStream. Other company, product, and service names located on the Website may be trademarks or service marks owned by others (the "Third-Party Trademarks", and, collectively with WitStream Trademarks, the "Trademarks"). Nothing on the Website should be construed as granting, by implication, estoppel, or otherwise, any license or right to use the Trademarks, without our prior written permission specific for each such use. Use of the Trademarks as part of a link to or from any site is prohibited unless establishment of such a link is approved in advance by us in writing. Use of any WitStream-provided Trademarks, service marks, logos or graphics without WitStream’s prior written consent is prohibited. Elements of the Website are protected by trade dress, trademark, unfair competition, and other state and federal laws and may not be copied or imitated in whole or in part, by any means, including but not limited to the use of framing or mirrors. None of the WitStream Content for this Website may be retransmitted without our express, written consent for each and every instance. Aristocrats retain all copyrights and other intellectual property rights in and to their Aristocrat Content. Similarly, Subscribers retain all copyrights and other intellectual property rights in and to the Subscriber Content. Aristocrats and Subscribers do, however, grant us and our sublicensees a non-exclusive, perpetual, royalty-free, freely sublicensable license to modify, compile, combine with other content, copy, record, synchronize, transmit, translate, format, distribute, advertise, publicly display, publicly perform, and otherwise use or exploit their Aristocrat Content and Subscriber Content and all intellectual property and moral rights therein in any way throughout the universe, in each case, by or in any means, methods, media or technology now or hereafter known or conceived. Aristocrats and Subscribers also grant us and our sublicensees the right, but not the obligation, to use their Aristocrat Content and Subscriber Content and the Aristocrat\'s and the Subscriber\'s Sign-In Name and avatar/photograph in connection with any use of the related Artisocrat Content or Subscriber Content permitted by the previous sentence and/or to advertise and promote the Website and/or WitStream. Any such permitted use or exploitation by us and/or our sublicensees of Aristocrat Content, Subscriber Content or other content described herein may be made without any compensation paid to Aristocrats and/or Subscribers, as applicable. In addition, upon the request from an Aristocrat, WitStream shall use commercially reasonable efforts to (a) redirect Aristocrat Content to third-party sites requested by the Aristocrat, including other micro-blogging sites and social networking sites; and/or (b) retrieve content posted by Aristocrats on third-party sites and post it to the Website. The Website makes it possible for Aristocrats to post Aristocrat Content on third-party websites. This use is accepted (and even encouraged). However, pages on such third-party websites that display Aristocrat Content must provide a link back to the Website. WE MAKE NO WARRANTIES OR REPRESENTATIONS ABOUT THE CONTENTS OF THE WEBSITE. WE SHALL NOT BE SUBJECT TO LIABILITY FOR ANY DELAYS OR INTERRUPTIONS OF THE WEBSITE FROM WHATEVER CAUSE. YOU AGREE THAT YOU USE THE WEBSITE AND THE WEBSITE’S CONTENT AT YOUR OWN RISK. WE DO NOT WARRANT THAT THE WEBSITE WILL OPERATE ERROR-FREE OR THAT THE WEBSITE, ITS SERVER, OR ITS CONTENT ARE FREE OF COMPUTER VIRUSES OR SIMILAR CONTAMINATION OR DESTRUCTIVE FEATURES. IF YOUR USE OF THE WEBSITE OR THE WEBSITE’S CONTENT RESULTS IN THE NEED FOR SERVICING OR REPLACING EQUIPMENT OR DATA, WE SHALL NOT BE RESPONSIBLE FOR THOSE COSTS. THE WEBSITE AND ITS CONTENT ARE PROVIDED ON AN "AS IS" AND "AS AVAILABLE" BASIS WITHOUT ANY WARRANTIES OF ANY KIND. WE DISCLAIM ALL WARRANTIES, INCLUDING, BUT NOT LIMITED TO, THE WARRANTY OF TITLE, MERCHANTABILITY, NON-INFRINGEMENT OF THIRD PARTIES’ RIGHTS, AND FITNESS FOR PARTICULAR PURPOSE. IN NO EVENT SHALL WE BE LIABLE FOR ANY DAMAGES WHATSOEVER (INCLUDING, WITHOUT LIMITATION, INCIDENTAL AND CONSEQUENTIAL DAMAGES, LOST PROFITS, OR DAMAGES RESULTING FROM LOST DATA OR BUSINESS INTERRUPTION) RESULTING FROM THE USE OR INABILITY TO USE THE WEBSITE AND ITS CONTENT, WHETHER BASED ON WARRANTY, CONTRACT, TORT (INCLUDING NEGLIGENCE), OR ANY OTHER LEGAL THEORY, EVEN IF WE HAVE BEEN ADVISED OF THE POSSIBILITY OF SUCH DAMAGES. SOME STATES DO NOT ALLOW EXCLUSION OF IMPLIED WARRANTIES OR LIMITATION OF LIABILITY FOR INCIDENTAL OR CONSEQUENTIAL DAMAGES, SO THE ABOVE LIMITATIONS OR EXCLUSIONS MAY NOT APPLY TO YOU. IN SUCH STATES, OUR LIABILITY SHALL BE LIMITED TO THE GREATEST EXTENT PERMITTED BY LAW. You agree to defend, indemnify, and hold us harmless from and against any claims, actions, or demands, including, without limitation, reasonable legal and accounting fees, arising or resulting from your breach of this Agreement or any of your representations or warranties given in this Agreement or your access to, use, or misuse of the Member Content, WitStream Content, or Website. We shall provide notice to you of any such claim, suit, or proceeding and shall assist you, at your expense, in defending any such claim, suit, or proceeding. We reserve the right to assume the exclusive defense and control of any matter that is subject to indemnification under this section. In such case, you agree to cooperate with any reasonable requests assisting our defense of such matter. WitStream respects the intellectual property rights of others and attempts to comply with all relevant laws. We will review all claims of copyright infringement received and remove Aristocrat Content or Subscriber Content deemed to have been posted or distributed in violation of any such laws. This Agreement is governed by the internal substantive laws of the State of New York, without respect to its conflict of laws provisions. You expressly agree to submit to the exclusive personal jurisdiction of the state and federal courts sitting in the State of New York. If any provision of this Agreement is found to be invalid by any court having competent jurisdiction or terminated in accordance with the Termination provision above, the invalidity or termination of such provision shall not affect the validity of the following provisions of this Agreement, which shall remain in full force and effect: "Intellectual Property," "No Warranties/Limitation of Liability," "Indemnification," "Termination of the Agreement," and "Miscellaneous." When you use the Services, you may provide us with personal information about you, such as your name, e-mail address, postal address, and telephone number (collectively, the "Information"). We do not collect any Information from you when you use the Services unless you provide us with the Information voluntarily (for example, by registering to become a "Subscriber" or "Aristocrat" or joining our e- mail list). We may automatically collect other types of information when you use the Services such as the IP address of your computer and what Services you use. We may use such information and pool it with other information to track, for example, the total number of visitors to our Services, the number of visitors to each page of our Services, and the domain names of our visitors’ Internet service providers. It is important to note that no personal information is available or used in this process. Also, the Services may use "cookie" technology to help us collect other non- personally identifiable information and to enhance your experience using the Services. Cookies are small packets of data that a web site stores on your computer’s hard drive so that your computer will "remember" information about your visit. If you do not want the Services to place a cookie on your hard drive, you may be able to turn that feature off on your computer. Please consult your Internet browser’s documentation for information on how to do this. However, if you decide not to accept cookies from our Services, the Services may not function properly. Aristocrats and Subscribers may access, review, and make changes to their Information by following the instructions found on www.WitStream.com. If you want to update your preferences regarding what mailings and other information you want to receive from us, you may do so by sending us an e-mail at privacy@witstream.com. You should be aware, however, that it is not always possible to completely remove or modify information in our databases. If you provide us with Information through the Services, we may use the Information to send you e-mail newsletters, as well as to inform you about other products and services that may be available through WitStream® or our third-party marketing partners. Also, we may share Information with others as described below. In an ongoing effort to better understand our users, we might analyze the Information that is provided to the Services in aggregate form. This aggregate information does not identify you personally. We may share this aggregate data with our affiliates, agents, and business partners. We may also disclose aggregated user statistics in order to describe our services to current and prospective business partners and to other third parties for other lawful purposes. We may employ other companies and individuals to perform functions on our behalf. Examples may include providing marketing assistance and customer service. These other companies will have access to the Information only as necessary to perform their functions and to the extent permitted by law. To the extent permitted by law, we may also disclose Information when required by law, court order, or other government or law enforcement authority or regulatory agency, or whenever we believe that disclosing the Information is necessary or advisable, for example, to protect the rights, property, or safety of WitStream® or others. The Services are operated in the United States. If you are located outside of the United States, please be aware that any Information you provide to us will be transferred to the United States. By using or participating in any of our Services and/or providing us with your Information, you consent to this transfer. In addition, the WitStream Services include a tool that allows you to sign in using information from your account with a third party service, such as Facebook, Twitter, Google, Yahoo or LinkedIn. Please be aware that those third party services are unrelated to WitStream, and that your use of the third party services is subject to the terms and policies of those services. ©2015 WitStream, LLC. All rights reserved. ©2012 WitStream, LLC. All rights reserved.